My memory of the relentless winter of 2018 will be that it continued on and on, vengefully adding that one little ice storm the second week of April. However, I was on a countdown to leaving for a week-long escape to Mexico. The weather may have been hard to ignore but I was dreaming of not being weighed down by layers of coats and sweaters and feeling the sun on my skin. My husband Scott and I have been traveling to Mexico since 1992, which means 26 years of exploring the interior through public transportation such as bus, collectivo, and train. We will never forget that first trip when we took the train through the states of Michoacán and Leon, stopping in Morelia, Patzcuaro, and Guanajuato, then traveling back to Mexico City where we caught the train to Oaxaca, meeting lifelong friends Robert Forman and Robin Schwartz. There are so many stories about these years of travel and changes within Mexico, such as the discontinued train service and increased flights to outlying regions, but I’m getting caught up in the past – what I am writing about today is escaping to a place that is filled with art and communities that engage with art that focus on enjoying a good life. This time, we had initially planned a trip to Mexico City, but hearing that our friends Rick and Oscar had never been to Oaxaca, we all booked an extra flight to Oaxaca to share travel experiences of Oaxaca. When I remember our travels, the best discoveries, most delicious food, and stunning art comes to mind. However, I am no romantic. I also remember the difficulties and challenges, like navigating one of the largest airports in the world with poor directional signage. Departing from Mexico City that morning, there were several lines filled with epic switchbacks of humanity pushing huge, bulging suitcases. We made our way into the right line creeping along for 40 minutes and just as we made our way to the fourth set of switchbacks into the bag check area, we were pulled from the line by an airline employee announcing, Oaxaca! As the lines re-organized themselves into those traveling to Oaxaca and those going elsewhere, we realized another 30 minutes had passed and the boarding time was 30 minutes away. No worries, we thought, all we have to do is check this suitcase and go through security. At the Mexico City airport, all the gates are numbered – we asked airport employees where gate T1 was, they thought there was a language error and checked the reader board – yes, T1. Some of the airport staff pointed in a direction trying to be helpful, others pointed in the opposite direction – we ran and ran, back and forth, and my step tracker recorded over two miles in that terminal. Finally, we found gate T1, upstairs one-half floor next to a pizza franchise – the gate had closed two minutes prior – we had missed our flight. That was when we discovered there were not many flights to Oaxaca, at least not that day. We could have bought a one-way ticket for four times the price on a major airline, but that didn’t seem like a real option. All of our past travel experience had given us the tools to get to Oaxaca today – we took a taxi to the TAPO bus station and boarded an ADO bus to Oaxaca at 11:00 a.m. The seven and a half hour bus trip seemed somewhat bitter, but we thought at least we’d be in Oaxaca tonight in time for dinner. The ADO Executivo bus service is clean and rather spacious, with reclining seats, restroom, and drop down screens with fascinating movies on them. As we traveled further south from Mexico City, we enjoyed the scenery of the high desert near the area of Tehuacán, seeing Joshua Trees and desert flowers similar to the area of Southern California where we all spent our childhoods. Mountains with cactus on the way to Oaxaca. The final few hours of the bus ride takes you over a windy mountainous road – about 30 minutes into this road our bus driver pulls the bus over, stops and gets out of the bus. Sitting at the back of the bus, I see him open an engine cover and have a discussion with another man – I thought, this can’t be good. The driver gets back on the bus and tells us that the bus cannot go onward due to mechanical difficulties. He will try to contact ADO bus company to have everyone picked up. One thing I have noticed as a traveler in Mexico is when news like this happens, people may be disappointed, but there is a communal sense that we’ll all get through this just fine. People got up out of their seat and strolled about outside, unpacked snacks, and we admired the moonflower bushes and rock cliffs on the roadside. We watched our bus driver try to scramble up a rock cliff in a valiant attempt to get a signal on his cell phone to make that phone call. Another thing I have noticed as a traveler in Mexico is that everyone will work together: the bus driver flagged down passing buses and everyone stopped to find out if they could help, take some passengers, or promise to call someone when they got to Oaxaca. The remaining passengers began to diminish as they got seated on each passing bus. After several buses stopped we were finally squeezed into a bus that delivered us to a station in Oaxaca a couple of hours later. Thought this looked like an Edvard Munch-inspired face, but it is simply waterdrops when it began to rain. While this was not the adventure we had planned, we met some new people and had good conversations, like Quetzalcoatl (just call him Quetzal) who is studying to be a medical technologist and was going home for a holiday, or Sara, the young Australian woman traveling to Oaxaca for the first time by herself. When we finally arrived at our lodgings, we felt fortunate and looked forward to dinner that night in Oaxaca. All photos in this essay by Linda Marston-Reid, copyright 2018. Kenro Izu is looking back at a successful photographic career that has spanned more than 40 years and acknowledged that it was a fellowship at the Center for Photography at Woodstock (CPW) that launched his career. Izu reflected on the opportunity and admitted it wasn’t just the money, but the importance of the professional encouragement of CPW’s founder, Howard Greenberg, and connecting him to opportunities to develop his photographic practice. During January 2018, Izu displays a selection of his photography series “Sacred Places,” which has been internationally exhibited. The exhibit is up at Aaron Rezny Gallery in Kingston and is organized by CPW, with a portion of sales to benefit the photography center’s programming. Izu uses a large-format camera favored by 19th-century photographers, stating that, “It captures air and the subtle nuances of tonality in platinum printing.” The 14-inch by 20-inch custom-made camera was purchased with funding he received from an NEA grant in 1984. Despite weighing 300 pounds, the camera has traveled with him during his photographic explorations, creating the platinum palladium contact prints that are included in this exhibit. The photographer has traveled the world seeking out the places that are sacred to people, including areas of Tibet, Cambodia, Thailand, Indonesia and India. Izu explained that he first traveled to Egypt in the 1970s and discovered he was especially drawn to the stone monuments. This has led to his photographing a number of places most would call the “Seven Wonders of the World,” including Stonehenge, Machu Picchu and Chichén Itzá. While traveling in Hampi, India, Izu came upon a sight that he captured in “Vijayanager #15.” The elaborate shrine-like structure was built on a massive stone, designating a sacred place reachable by rock climbing. The contrast between the giant rock and the detailed architectural structure is surprising. In another human touch, the base of the stone has been patched to ensure its continued stability. Kenro Izu captured “Vijayanager #15” in Hampi, India. In the image “Kanchipuram #638,” the photographer has placed himself within a sacred space on a pathway with the deity directly ahead. In the shrine’s low interior light, viewers can observe carved stone columns receding into the distance along a pathway alight with devotional fires. “Kanchipuram #638,” by Kenro Izu, depicts the interior of a sacred space in India. In “Ladakh #49,” captured in Ramayuru Gompa, India, the photographer uses the light across the mountains to highlight the sacred temple built on a hill surrounded by a small village. Capturing the last light of the day, the spectacular shadows encircle the sacred place in a series of gradations, creating an abstracted composition of darks and lights. Izu travels to and focuses on a region, becoming familiar with the local customs from there; he awaits inspiration to discover the sacred places. As his travels took him to the far reaches within Cambodia and Laos, he was moved by the children’s dire health conditions. On his return to New York Izu founded a charitable foundation, Friends Without a Border, that built a free pediatric hospital in Cambodia in order to give back to the people who have inspired his photographic journey. 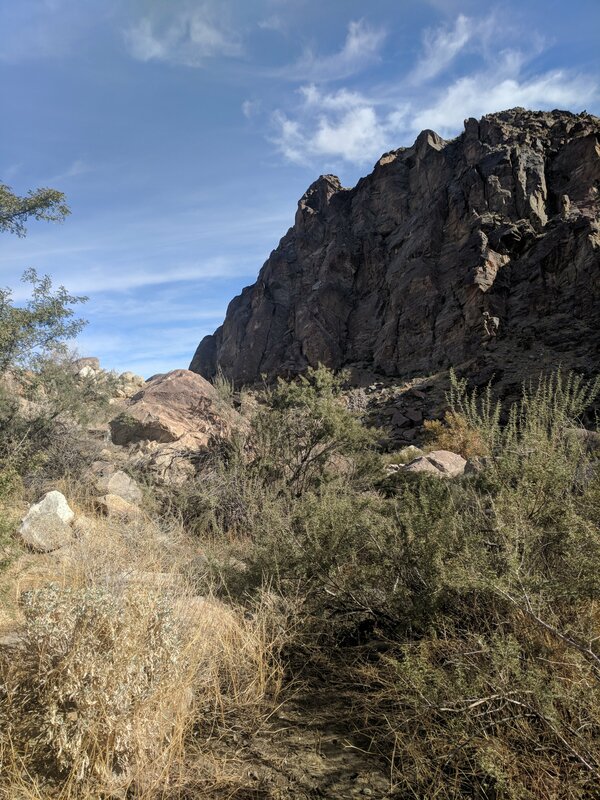 Marking the first day of winter, I walked up a Palm Springs trailhead passing by barrel cactus, creosote bushes and rock formations framed against a brilliant blue sky. Photograph of the writer by Kelly Groves. Looking over the valley certainly puts a perspective on life equalizing all the political intrigue and petty issues of everyday matters. I am so thankful that my family led me to another place of incredible desert beauty. 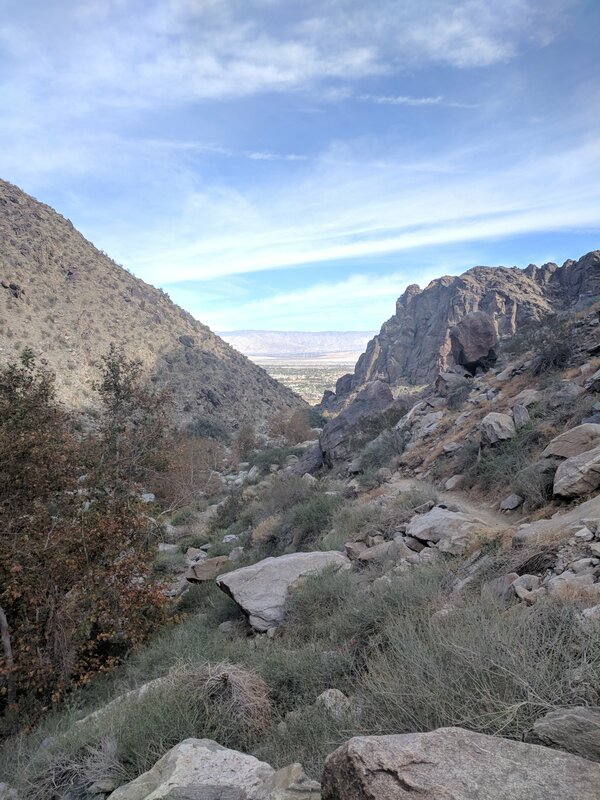 The Tahquitz Canyon was a lovely, quiet walk through the desert that ended with a 60-foot waterfall, through rocks and native plants. Home to the Aqua Caliente Band of Cahuilla Indians, it is indeed a cultural treasure. This is the walking that feeds the soul. Today with one day left in 2017, I am contemplating not only what 2018 will bring, but what I will seek during this new year. Growing up in Southern California, nearly every summer vacation included a family trip in the station wagon to visit relatives in Missouri and Arkansas. The route we traveled on was always the old Route 66, another story all by itself. The drive was mercilessly boring so the least little thing would amuse me and my six siblings as we made our way eastward. Looking out the car window for something to entertain us was a good way to pass the hours. The giant jackrabbit signs perched on hills above Route 66 for Jack Rabbit Trading Post were a spectacular sight. They taunted us for miles while we imagined all the wonderful curiosities that the Jack Rabbit Trading Post held – I mean, arts and crafts – I was THERE! And then finally, we would spot the one that read, Here it is! Oh, the pain as we sped by each and every one. Overslept, / So tired. / If late, / Get fired. / Why bother? / Why the pain? / Just go home / Do it again. It might be a child’s project, or perhaps a creative release for someone who wanted to have some fun. I was delighted and will continue to be on the lookout for more signs of encouragement. Winter is here, bringing cold slush, freezing temperatures and making me think about heading back to Mexico. The temperatures are not only warmer, but the people are friendly and the food is wonderful. Finding good food in Mexico City is easy enough – just walk into the nearest little place and order the menu of the day. Most of the time lunch will include soup, salad, main dish and a dessert. Eating this way is easy and inexpensive, but the more we wandered through markets with the stunning piles of chiles, fresh squash blossoms, fruits and tortillas, the more we talked about how fun it would be to be able to make our own meals. During our last trip to Mexico City, we stayed in an Airbnb with a kitchen, which opened up the possibility of shopping and cooking our own meals. First, I should mention we are a family of people who love to cook, including two chefs who make their living this way. There are few travel activities more exciting than wandering through a food market and finding new options for dinner. Some of the food is simply beautiful in its color and pattern, such as the stacks and stacks of dried cereal, pasta, and spices. Other types of foods we had no idea what we were looking at and had to ask how the vendor cooked it at home. 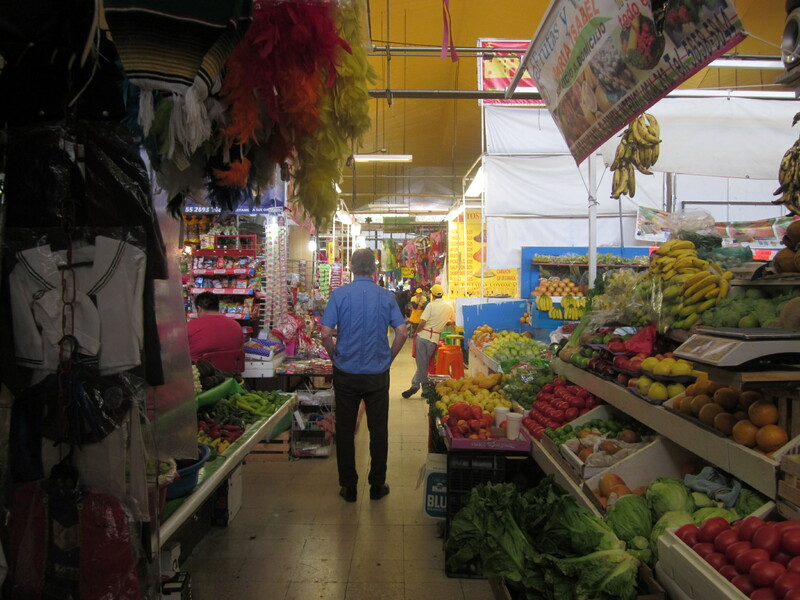 Shopping in the neighborhood also gave us a glimpse of life in that community, since we had to visit the green market, the Mercado for supplies, the bakery, and a liquor store for our favorite tequila, Gran Centenario. Dessert from the bakery – an important part of dinner. We enjoyed every minute of these neighborhood wanderings and arrived back to begin preparing that evening’s feast. Dinner one night included a simple stew with garbanzo beans, corn, tomato, and small red potatoes – it was delicious, but the experience of shopping and cooking was a large portion of the pleasure. I love a Mercado! 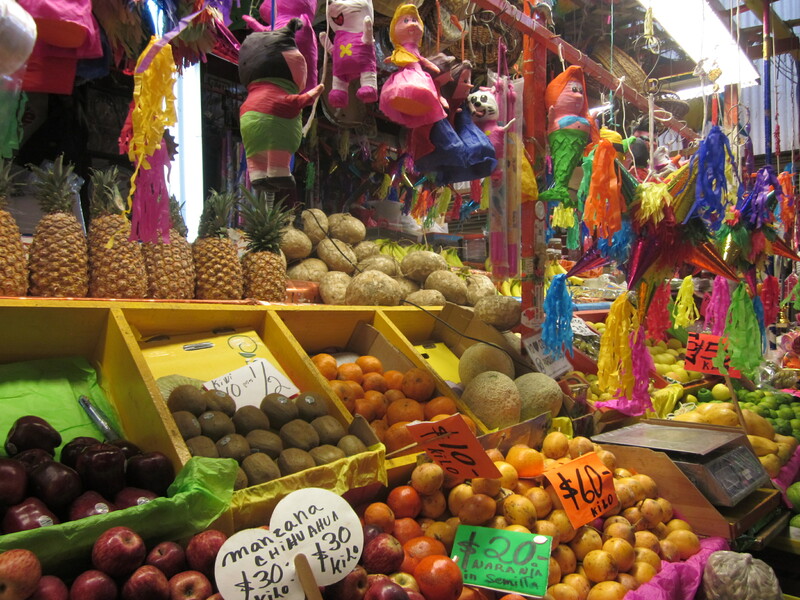 Across the major neighborhoods of Mexico City, Mercados are the center of commerce and the interactions of daily life and should be part of every visitor experience. 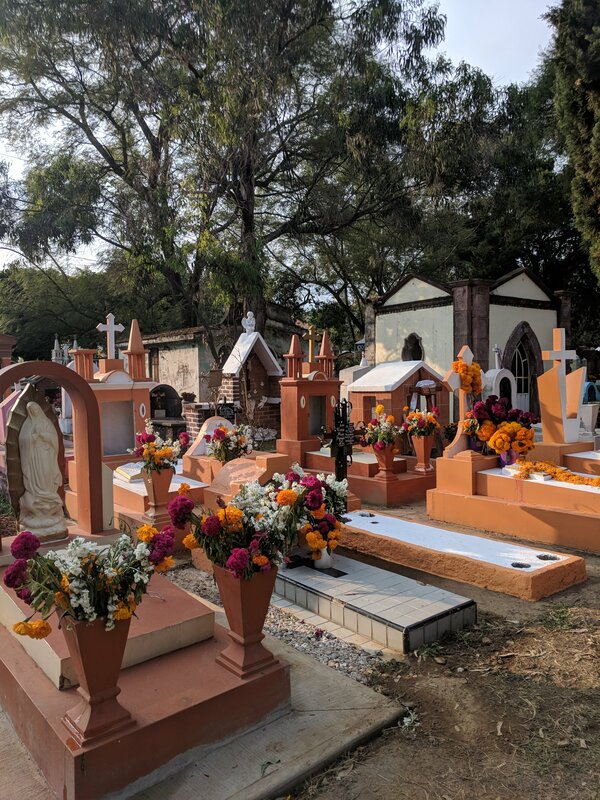 During a recent trip to Mexico City we stayed outside the center in Coyoacan, a quieter community where Frida Khalo, Diego Rivera, and Leon Trotsky once lived. 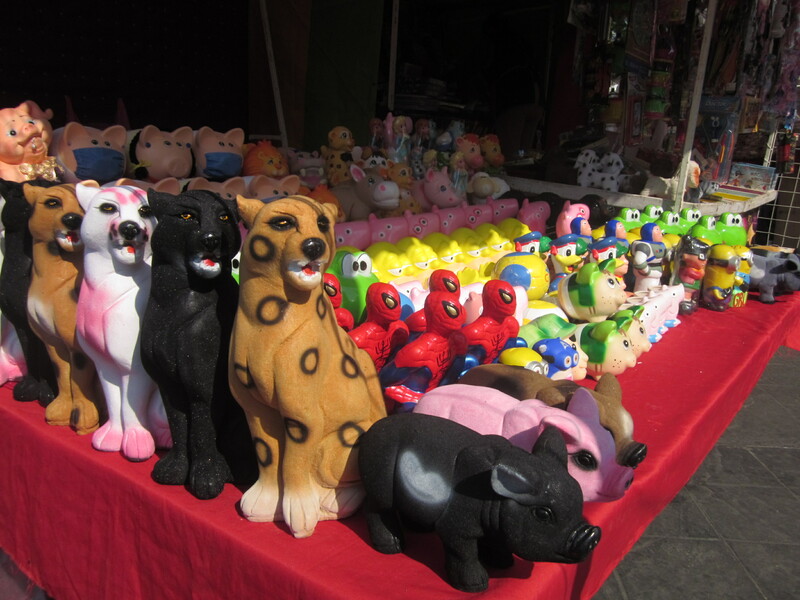 The Mercado Coyoacan has everything a local resident might need in daily life, from birthday gifts to fresh tortillas. In fact, the entry we came through had a tortilla machine cranking out fresh tortillas. Walking through the aisles I am always struck by the beauty of the displays – whether the rows of cactus fruit, or the pyramids of differently colored red chilies, it is visually beautiful. The perfume of each section will assail your senses as well – I always stay away from the meat aisles for this reason. There is a pride and showmanship in each merchant’s displays – whether you are selling fruit or toys, items are arranged with an artistic eye and precision. Small food stalls sell fresh fruit drinks, breakfast, lunches and snacks. Sitting down at the counter and ordering the specialty can be one of the most wonderful parts of your visit to a Mercado.